Another option to increase the URL size limit is to configure the <requestLimits> element. The <requestLimits> element specifies limits on HTTP requests that are processed by the web server. These limits include the maximum size of a request, the maximum URL length, and the maximum length for a query string. Wondering how to enable NTFS long paths in Windows Server 2016 to increase the 260 characters limitation for NTFS paths? Set the Maximum allowed content length, Maximum URL length (Bytes) and Maximum query string (Bytes) to your desired values. The default maximum query string length in IIS is 2048 characters. 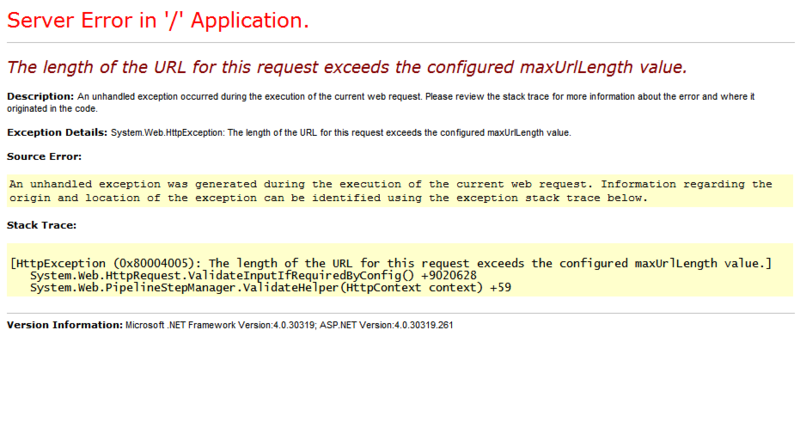 When a query string is received by IIS that is longer than 2048 characters, IIS throws a 404.15 - Query String too long error. 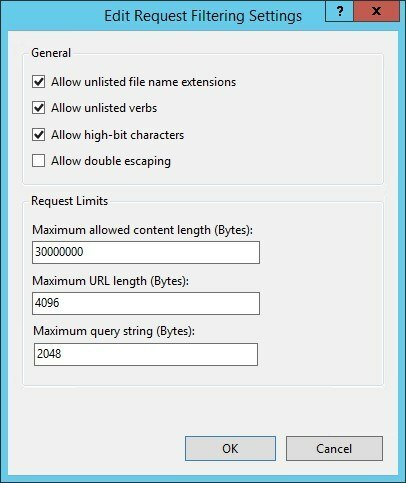 A value of 2083 characters is the maximum URL length for Internet Explorer by default, and an 404.14 – URL too long error is thrown when a longer URL is requested. You can increase this maximum URL length value in your web.config, but it’s still browser specific.